I picked up Amy Davis Abdallah’s The Book of Womanhood with some trepidation. Despite being female, I’ve never really identified with the term “womanhood.” I have a distinct lack of what are generally considered feminine attributes. I grew up viewing womanhood as something far removed from my inner self. It was more of a cage that my body confined me to than a gift. So while I was interested in hearing what the book had to say, I was pretty certain I was not going to enjoy it. It’s clear from page one: womanhood is not about being passive, it’s not just about being a wife and mother, and it’s also not a box to squash ourselves into. 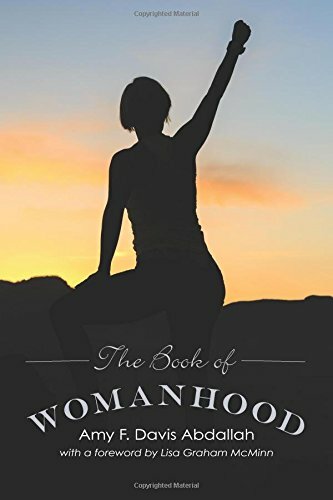 As she says in the introduction: “I suggest that the true identity of a woman (or a man) is realized through developing relationship with God, self, others, and creation.” The goal of The Book of Womanhood is to create a way for us to explore these different areas of relationship and come to a more secure knowledge of ourselves as women. Based on her program “Woman” at Nyack College, Abdallah leads women through a simple rite of passage, exploring each of these areas of relationship (God, self, others, and creation). Ultimately, women are left, not with a role to conform to, but with a framework which enables them to explore who they are, and a platform from which to grow and develop. Each chapter combines a biblical point of view with real life experiences of both the author and other women who have undertaken the program. Each section concludes with discussion questions and a prayer. This format and style make the book ideal for use in a group or pair format. Even solo readers are encouraged to develop a strong community in which to learn about themselves. I read this book on my own and learned a great deal from it, but the real strength and purpose of this book is found in community. We don’t live life in isolation. I would love to use this book in a mentoring or group context, encouraging other women to discover who they truly are. As mentioned, the book is split into sections that address each area of relationship. Abdallah begins by examining our relationship with God and our identity as image-bearers. The book explores how femaleness reflects God’s image, and examples of women in the Bible in a wide variety of roles. Much of this was familiar to me, but a new spin in the realm of identity made it well worth the review. The next section deals with relationship to self. Abdallah develops a holistic view of our sexuality and offers sound advice on physical and emotional self-care. In the section focused on relationship with others, she covers a wide range of interpersonal relationships with guidance on how to develop healthily within them. Singleness, dating, men, and mentoring all receive due attention. The inclusion of the final section, relationship with creation, surprised me. Christians don’t often consider creation as a part of our identity. Yet, Abdallah points out that part of our creation calling is stewardship of the earth. This book really challenged me to take that more seriously. Much of the theological basis for the book is rooted in Abdallah’s interpretation of creation in Genesis—fully affirming the equality of men and women in gifting and calling. I found the discussion of femaleness as equally reflective of God to be one of the most thought-provoking sections of the book. Both maleness and femaleness are inspired by God’s image, but Christians often elevate typically masculine attributes over feminine traits. Abdallah demonstrates how these typically feminine attributes—such as mercy and sensitivity—are clearly expressed in God’s character. The Book of Womanhood encourages us to re-value those expressions in our own lives, and in the lives of the women and men around us. Although she provides a solid foundation for the equality of men and women, this isn't a book which explores or argues for these points. Rather, The Book of Womanhood lays them as the solid foundation from which to build women's identity. The building of identity is a spiritual discipline that is missing from my own ministry context. Many of the topics covered, such as care for our physical selves, developing healthy male-female relationships, singleness, and dating, are overlooked in Christian community. In my experience, people suffer when they don’t have healthy foundations and teachings in these areas. I’ve not only learned to call myself a woman, but also that it’s a really good thing to be. It’s not about conforming to a prescribed role. Womanhood is about reflecting who God is and valuing his image as it is expressed in femaleness. The Book of Womanhood was insightful, refreshing, and challenging. Abdallah encourages creativity, healthy relationships, and most of all, growth into who we truly are. Beyond the obvious applications for ministry, it has changed how I see myself, and challenged me to care for myself holistically. The Book of Womanhood addresses an area of spiritual development that is sorely lacking in the church—that of holistic growth into and within womanhood from a biblical egalitarian perspective.